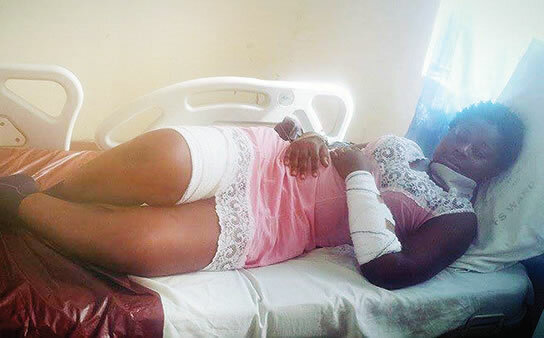 A National Youth Service Corps member in Bayelsa State, Miss Loretta Okoro, has cried out for help over pains caused by bites she sustained from her employer’s dogs. Our correspondent gathered that 28-year-old Okoro was bitten by security dogs in her employer’s house on December 5, 2015, where she was posted for her primary assignment. It was learnt that three dogs on the premises of the employer, Prof. Klem Imananah, reportedly pounced on the corps member at about 7pm on that day. Speaking with PUNCH Metro on Tuesday, Okoro lamented that her employer and the state chapter of the NYSC had abandoned her to her fate. Okoro, a member of Stream A, with NYSC number NUA/2015/162926, said though the wounds had healed on the surface, she later started suffering from hallucination, numbness, mental torture and psychological imbalance. Okoro, who said she was posted to the residence of Imananah at Opolo in the Yenagoa Local Government Area of the state, accused her employer of neglect. “Even the owner of the dogs has been threatening me with court action, saying that I am embarrassing him. Okoro, an indigene of Imo State, appealed to the federal and state governments to wade into the matter. Okoro’s colleague, who identified himself only as Kingsley, said the victim’s health had worsened, adding that she needed urgent medical attention. The employer, Imananah, confirmed that Okoro was bitten by his dogs but said he ensured the corps member was treated until her injuries healed. He said his dogs were free of rabies, adding that Okoro would not be alive if she contracted rabies from the incident that occurred since December. Imananah said he spent about N200,000 at the FMC to treat Okoro, adding that she was given full dosage of anti-rabies at the hospital. The state Coordinator of the NYSC, Mr. Anthony Ekeocha, when contacted said he could not respond to the matter on the telephone.